This volume concentrates on the complete letters from Pococke to his mother, giving colourful descriptions of the travellers' visits to royal and imperial courts of Europe. 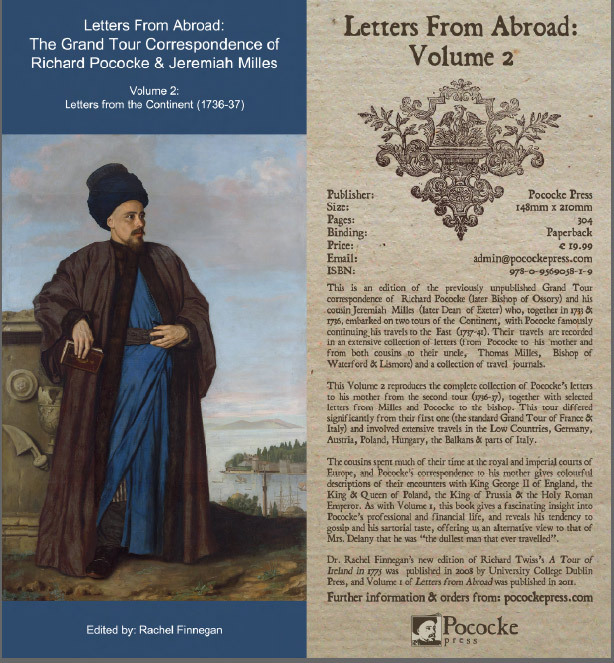 It also includes selected letters from Pococke and Milles to Bishop Thomas Milles, their uncle. Dr. Rachel Finnegan is a lecturer at Waterford Institute of Technology. She has written on the connoisseurship of the 2nd Earl of Bessborough, the Divan Club & Bishop Pococke's "improvements" to St. Canice's Cathedral Kilkenny. Her new edition of Richard Twiss's A Tour of Ireland in 1775 was published in 2008 by University College Dublin Press and Volume 1 of the present series was published in 2011.